T-Mobile's flamboyant CEO John Legere has a Facebook account. That account is the gift that keeps on giving when it comes to trolling other carriers, but especially Verizon, about data speeds. It also comes in handy to whip up LTE speed comparisons at the Super Bowl 50 with everyone, but especially with Verizon. 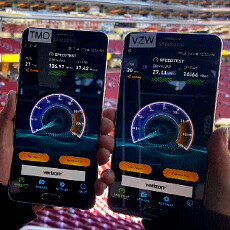 John Legere posted a picture with two phones, one on T-Mobile, and one on Verizon, directly comparing the speeds that each network was able to muster at the stadium. Needless to say, the comparison is in T-Mobile's favor, as it managed to score almost four times Verizon's result on the download side, and more than two times on the uplink. T-Mobile didn't stop here, though, as it issued a chart comparing the average LTE speeds that all four major carriers were able to deliver in San Francisco around game time, and Verizon is lagging quite behind there, despite a $70 million investment to boost coverage in the area before the game. Big Magenta also had a 30-second spot during the game, dissing Verizon again, which you can see in the slideshow below. Verizon, however, is quite nonplussed from all the trash talk, it seems, and issued a rebuttal ad, where a guy with a magenta beanie is still waiting for said T-Mobile ad to load, while his friends are getting impatient around him. Pass the popcorn, organic non-GMO if you have it. Oh, snap: "Looks like Verizon spent that $70M to come in second at the Super Bowl." Wow T-Mobile is really stepping up their game when it comes to speed, reliability, and coverage. I think they are quickly becoming one of the best carrier you can have today. It does. I live in a rural/town area in the Northeast that is a popular vacation area but not living area. T-Mobile had no coverage there up until very recently. They've added a tower to improve coverage in that area. THough Verizon still crushes them. Agreed. I love the family data plan by the way, gets me unlimited data at a fraction of the price by splitting with my friends! Americanism at its finest, anyone? Meh, I'd rather have a network that gives me 20+ everywhere than one that gives me 100+ in 2 spots in the whole city then is spotty the rest of the time and is useless when I go out of town. Good to know that all recent tests have put tmo on par or faster than big V in all tested areas....but screw that right? Tests sponsored by who? This is the one area where anecdotal evidence is more reliable imo. I don't believe any of the carriers ads. Each one has a "study" where their brand was best. Something not quite right with that. I rely on people who have switched and seem objective and Tmo just seems to have spotty coverage for most. Not to mention testing a spot in downtown LA, SF, NY is not useful to most of us. Sponsored by some mag, not by any carrier. In fact they still rated Verizon better. And Verizon came out the winner. However, when you look at the areas tested, TMO was either faster or about 1Mbps off Verizons speed. For a carrier that is 3rd or 4th in users, catching up to big red in any sense to the point that is almost make no difference between the two, means you are simply over paying. oh you mean the same test in which Sprint also claims to have faster speeds???? That test. Every carrier is out to bash on the best and right now it's Verizon and it will be for a long time. Like natypes wrote, I would rather have consistent network then dead spots and no service inside buildings. Where I live and work, T-Mobile is consistently faster than Verizon. My personal phone is T-Mobile and my company gave me a Verizon Hotspot. T-Mobile also works inside the building where I work, in which AT&T is poor to unusable, Verizon the same, and Sprint works outiside only. That's the West Palm Beach, FL area. The fastest I've gotten in this general area with T-Mobile has been 133 down and 35 up. On Verizon it was about 44 down and 16 up, but the majority of speed tests I've taken are more around 8-13 down and 3-6 up. Despite Verizon's ads, I've never had a moment in my personal experiences where I'm waiting for something to load on T-Mobile where Verizon wasn't in the same crappy boat. It all depends on where you are, and based entirely on my own experience, I'm not at all inpressed with Verizon and their ads about a superior network so far. Because its about coverage. Always with these carriers its abut coverage. My personal experiences. T Mobile was great at an apt complex and Verizon wasnt. Leave that apt complex and Verizon's coverage strength showed up. I just posted about how my job had a Sprint tower on the roof. Sprint phones worked great, Verizon's didnt. Leave the building and the truth comes out. Even for underground Verizon and AT&T worked great. Cant say the same about the other 2. Its always about overall coverage, reliability. Not fastest in a small area. Anyone spouting off about T-Mobile who hasn't used it in the last 6 months is doing no one any favors. West Palm went from good to great with the deployment of band 12. Verizon is to this day unusable at I95 at the PBIA flyover. Unacceptable in 2016 and for a carrier that claims to be the best. Good thing TMO covers 95% of all Verizon customers with their new band 12 and upgraded towers. Actually they are tests done by mags or simply, pulling up websites like speedtest.net or others. Every test I have seen that had no carrier involvement TMO either basically tied big V or was faster. He sat in every seat in the stadium before he got Tmo signal in order to the speed test. 100 Mbps, this is crazy. So you get these speeds everywhere. It's faster than my WiFi LOL(80 Mbps). Not everywhere, but their network average is rather high on last check, higher than V in a good number of spots. Basically TMO is quickly, becoming pain to Verizon, in a good majority of areas...some rural still suffers. IMO T Mo would have to get in line to be a pain to Verizon. In my unscientific testing Verizon and AT&T are really close in network coverage. Sprint and T Mo behind those 2. Maybe T Mobile is in 3rd place. But they have to deal with AT&T for 2nd place. I don't know about get in line. Here in my city, TMO crushes them...however TMO has a presence here along with Verizon, they both have huge 1000 employee call centers here. But as stated, it always depends on where you are. For me, Verizon is simply an oversized pain, everyone I know left them ages ago. And the ones that left TMO back in the day, now have come back after they see my unlocked ATT phone kicking the crap out of their phones coverage. T-Mobile and Verizon got no chill AT ALL hahaha!! Interesting to see that AT&T and Sprint were right there behind TMo. I bet Legere would have loved to bash them as well. I'm almost wondering if TMo, AT&T and Sprint all added additional temporary signal boosters around the arena to help compensate for the heavily concentrated wireless use during that weekend. If so, then Verizon should have done so as well. Either way, according to that picture, Verizon wasn't lacking in signal strength, just speeds.